I often get e-mail from readers asking about what audio equipment I use. While I’m not an audiophile, I do listen to music on decent equipment, in my office (I have a DAC and amp, with bookshelf speakers, connected to my Mac), in my living room, and when I use headphones. While I like listening to music with headphones, I do realize that it is, in some ways, artificial to listen with them. Instruments that are off to one side sound much further away from the center of the soundscape than when you listen to a stereo. I like the effect of having the music “in my head,” but for some types of music, and some recordings, this isn’t ideal. This is the case with some symphony recordings, and some recordings of string quartets, where the instruments are separated too much. Generally, rock and jazz sound fine with headphones, but with any kind of music, good headphones are unforgiving. It’s much easier to hear any weaknesses in a recording when listening with headphones. Nevertheless, I do use headphones often. Here are the five headphones I use. There are times when I want to listen outdoors and not hear the sounds around me. This was a particular problem last year, when there was construction next to the house I was living in. Having moved since then, there is, at times, a bit of street noise around my new home. So sometimes I like to sit outside and listen to music, and I want to hear just the music. Following a recommendation from my Macworld colleague Dan Frakes, I bought Audio Technica’s ATH-ANC7B, a noise-canceling headphone. While this suffers from the problems inherent in this type of headphone – the sound is good but not great, and wearing them makes your ears warm – they do offer good enough sound that I am not disappointed. I could have spent twice as much and gotten Bose noise-canceling headphones, but I didn’t want to, as I don’t use them enough to make it worthwhile. I find the Audio Technicas to be quite good, and certainly good enough for my use. Finally, I have a set of full-sized headphones for “serious” listening. I used to have a Sennheiser HD-580, an excellent headphone at an affordable price, but after about 15 years, they started sounding a bit dull. So I asked around, and my friend Doug Adams, of Doug’s AppleScripts for iTunes, recommended Beyerdynamic’s DT 990. I bought them from Amazon so I could return them if I didn’t like them – I don’t have a local store that sells headphones of this type – but I quickly realized that this was the kind of sound I like. The bass isn’t overdone, the treble is clear, and the definition is subtle and balanced. These are open headphones, so you don’t want to use these if you’re listening to music with other people around you. The foam rings are soft and plush, and the headband is comfortable. I can wear these for hours and not get tired, which isn’t always the case with full-sized headphones. Oh, and I got the 32 ohm version, so I can use them with my iPods, as well as with my stereo. Following comments to this article – both posted below and by e-mail – I decided to try out Sony’s MDR-V6 monitor headphones. These are available at around $75, and were recommended by both casual listeners and people I know who work in the music industry. These are interesting headphones. They are closed, and offer a bit of passive noise reduction. They are light and comfortable, and the earpieces fold up, making them easily portable. And they have a coiled cord, which can get less tangled than a long, straight cord. As far as listening, I’ve only had them for a short time, and they are very bright, very clear headphones. The bass response is limited, but this could be because they aren’t broken in yet. But the resolution and spaciousness of the sound is excellent. While I prefer the warmth of the Beyerdynamics, especially for classical music, these Sonys sound great with music that has energy. This is an excellent sub-$100 headphone. I’d been looking for a Bluetooth headset for a while, and tried a Sennheiser, MM 400 model. I was very disappointed. The sound was terrible, and they were very uncomfortable, so I returned it. Then I came across this Philips SHB9100/28 Bluetooth Stereo Headset, and I think I’ve found the right one. It’s light, and very comfortable, with large ear pads that cover my ears entirely. This means that they provide some passive noise reduction, so if you’re in the street, listening to music, you won’t hear the cars as much. They’re obviously not noise-canceling headphones, but they do a good job of reducing chatter. The sound is excellent. The bass is sufficient for a small headphone, and the stereo separation is excellent, with clear midrange and treble. They also come with a cable, so you can use them as wired headphones if the charge runs out. The charge with a USB cable, and are rated to last about 8 hours (though I’ve always charged them before they run out). If you’re curious about the different types of headphones, see this TechHive infographic that explains the differences. If you have any favorite headphones, feel free to mention them in the comments. Update: I’ve reposted this article because with the release of iTunes 11, the Gapless Album tag is no longer available in the program. However, many people don’t understand this, and think that the removal of this tag means that iTunes no longer plays music without gaps. This is incorrect. Read on and understand what this tag was for. Following a comment from a Twitter friend, asking how to find which of a number of albums require gapless playback, I pointed him to an old article on this website. (I won’t link to it, as it was written in 2006, and addressed the problem of gapless playback on the iPod.) I realized that many people don’t understand what that Gapless Album tag is, so here’s a brief explanation. So, unless you use Crossfade Songs, you never need to worry about this tag. See Apple’s technical note about gapless playback. Christopher Hitchens never shied away from telling the truth – at least the truth as he saw it – and when he was diagnosed with stage 4 cancer in June, 2010, he started “living dyingly,” writing about his experiences with the illness. The stoicism with which he wrote, and the lucidity in the face of immanent death (“there is no stage 5”), go very well with the way Hitchens faced the rest of his life. Having only recently completed a memoir, Hitch 22, and on his book tour when he had symptoms which led to his diagnosis, Hitchens realized that he needed to tell the story of this cancer as he had just told the story of his life. You’ll read this book in an hour or two, but you’ll also want to come back to it from time to time. While the chapters are composed – these are articles, not journal entries – there is a spontaneity throughout them, as his condition worsens, and as hope seems to recede. Hitchens again shows with his words that cut like scalpels that he was one of the finest voices of his generation, and we’re not likely to see another like him for a very long time. 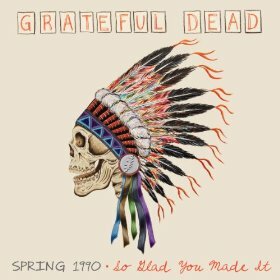 If you follow this blog, or read my writing on Macworld, you’ve noticed that, among my varied musical interests, one artist stands out: the Grateful Dead. I’ve been a Deadhead for 35 years, since I first saw the band in the Spring of 1977 at the Palladium in New York. (To be honest, I was already a fan by then, having heard a number of their albums, both live and studio.) People sometimes ask me to recommend a Grateful Dead album for them to discover, and this post answers that question. In late 1974, the Grateful Dead decided to “retire.” At the time, it wasn’t clear if the band would continue, but the increased pressure and cost of touring with their one-of-a-kind “Wall of Sound” sound system, made them realize that they couldn’t go on. They had to tour to pay for the cost of touring, and the time it took to set up and break down the Wall of Sound make touring more complicated. So to celebrate their retirement, the Dead played five shows at San Francisco’s Winterland Ballroom. Introduced by Bill Graham, the legendary concert promoter, these last five concerts were held from October 16-20. On the 20th, Bill Graham had the concert tickets stamped “The Last One” as a souvenir for those attending. But while the Dead suggested that this would be a retirement, they actually had big plans for the final run. Much of the music was filmed and all of it was recorded with the idea of making a movie. Jerry Garcia was the engine for this project, and during the hiatus – the band came back to performing in April 1976 (there were four gigs in 1975) – he worked on editing the movie. Released in 1977, the Grateful Dead movie was an attempt to translate the experience of a Grateful Dead concert to the screen. Concert movies were a recent phenomenon at the time, and this was more than just a film of the concert. There is footage of people waiting in line, interviews with Deadheads, clips of people dancing and enjoying the music, and some pretty hokey animation, notably a long animated introduction. The movie fails as both a concert movie and as a documentary, but, back in the day, it was amazing to see such great footage of the band on a big screen. For years, the tapes of these five shows languished in the Grateful Dead vault, until a re-release of the movie on DVD in 2004, when the best parts of the five concerts were remastered and released on five CDs, for a total of about 6 1/2 hours of music. (This is a bit more than 1/3 of all the music played on those five nights.) Each of the CDs tries to represent a set of music; the songs flow together well, even on the discs where the music is from different nights. Three of the discs are essentially all from single nights, with a couple of exceptions. One reason why the Grateful Dead was so interesting is because no two concerts were the same. Not only did they not have set lists – they’d choose what to play as they went along – they were consummate improvisers, and would segue from one song to another seamlessly. There were some songs that were often played together, and that formed units: China Cat Sunflower > I Know You Rider, Scarlet Begonias > Fire on the Mountain, and Not Fade Away > Going Down the Road Feeling Bad. But in 1974, only the first (China > Rider) was immutably joined, and from one show to another, the order of songs would change. In addition to these fluid set lists, the Dead would often jam on songs for a very long time; the longest track in this set is the 31:45 Playing in the Band, which is a perfect example of the band’s transcendent improvisations. 1974 was a watershed year for the Dead. One of the founding members, Pigpen (Ron McKernan) had died in 1973, and the Dead dropped many of the songs that he made famous, such as the long R&B-inspired Turn On Your Love Light, In the Midnight Hour, and Dancing In the Streets. Pigpen was a male Janis Joplin (they were lovers for a time), and he lived the blues the way he sang them; so much so that liquor killed him. After Pigpen’s death, the Dead took a new direction, veering away from the early R&B songs, and the later folky Americana, toward some jazzier playing. That comes out here in the long Eyes of the World, a 1973 release, the mystical Playing in the Band, and Bob Weir’s Weather Report Suite, a long ballad. The Dead still played their staples: songs like U.S. Blues, He’s Gone, and One More Saturday Night, but this set doesn’t feature any of the “cowboy” songs the band played consistently in the early 1970s, such as Jack Straw, Beat It On Down the Line, Loser, Friend of the Devil, El Paso, or the perennial Me and My Uncle. The band played these songs at the five concerts, but they weren’t selected for this box set. So on five CDs, this set gives an excellent overview of the Dead in 1974. Free jams, tight songs, a jazzier sound than in, say, 1972, but with all the power and mastery that the band had developed since their formation in 1965. 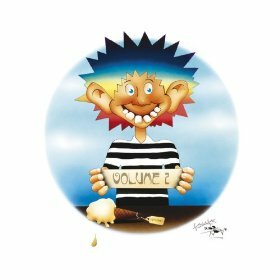 While the Complete Europe ’72 box set remains the ultimate document of the Dead on tour, these edited recordings are probably the best introduction for someone interested in discovering the wide range of music the Grateful Dead played. (If you want a sample of the Dead on tour in 1972, the recent Europe ’72 Vol. 2, culled from that complete set, and tastefully remastered, is for you.) Or better yet, get both. All recordings of concerts are artificial. But once you’ve gotten that out of the way – you simply accept that you can never reproduce the actual sound of a live performance – you have to approach the question of how these recordings should be mixed. Not only are there questions of the volume of individual voices, instruments or groups of instruments, but also where they should be in the soundscape. 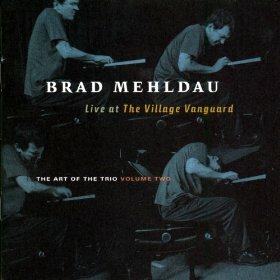 In the simplest type of live recording, you have one performer playing a solo instrument; say, a guitar. That instrument is centered in the soundstage, and there are no problems. Add a singer to the guitar, and it’s still simple to position. But move to a slightly more complex instrument, such as a piano. There are two ways to record a piano, using microphones or a pickup. 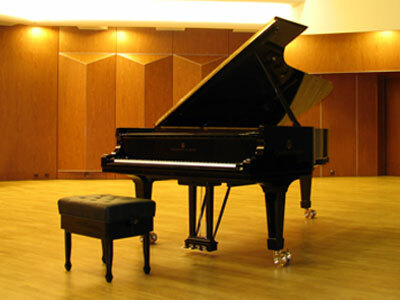 With the former, you can position microphones around the piano – most often, this is just two microphones placed facing the open lid – or you can use a pickup, which is transducers placed on the soundboard inside the piano. (There are many ways you can combine these devices, or use multiple microphones, both inside and outside the piano.) But a recording engineer faces a dilemma: do they place the piano in the center of the soundscape, or do they try to position it so the different keys are heard in different locations? I’ve heard recordings which are made to sound as though the listener is sitting in front of the keyboard; the lower notes are to the left, and the higher notes to the right. This is essentially false, because no one other than the performer hears a piano in this way. However, it does give the piano a bit more “life,” and makes the sound less static. When there are multiple performers, the questions become much different. Generally, you want to have the performers sound as though they are in their appropriate position on stage. So a string quartet will have two instruments more on the left channel, and the other two on the right (generally the two violins are on the left and the viola and cello on the right). But I’ve heard string quartet recordings where the two instruments on the left are almost entirely on the left channel, and the same for the instruments on the right. This approximates what it would sound like to be in the middle of the string quartet, but no one ever sits there. Take the same artist when he’s in the studio. 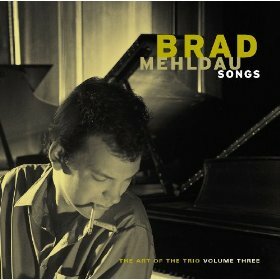 On Songs: The Art Of The Trio, Volume Three, recorded in the studio, the piano is centered, and the drums are quite creatively spread across the soundstage, while the bass is also centered. Musically, this is much more interesting than if the instruments were positioned laterally. This positioning is even more obvious in the recent Grateful Dead releases from the band’s Europe 72 tour. You can hear this clearly on the Europe ’72 Vol. 2 release, notably on Dark Star. When the Grateful Dead performed, Jerry Garcia was stage left, Bob Weir in the center, and Phil Lesh stage right. Garcia’s guitar, in these new mixes, is far to the left, but Weir’s guitar is on the right channel. Lesh’s bass is in the center; I agree that the bass should be centered no matter what, but the positioning of the guitars is simply odd. No one would have heard the music like that, unless they were in the first few rows, and even then, the resonance of the halls would attenuate that positioning greatly. Add to that the fact that the vocals are centered. This is logical, but having Jerry’s guitar far to the left and his voice in the center is a bit jarring. The Grateful Dead’s recent release of some music from their Spring 1990 tour follows this approach. But the drums are more spread out than in the Europe 72 mixes (probably because the multi-tracking used in 1990 allowed for this giving more tracks to the drums), and the keyboards are also far to the right (keyboardist Brent Mydland did sit on the right, as did keyboardist Keith Godchaux, in 1972). But on these recordings, Bob Weir’s guitar is in the center, which is more logical. No matter what, an engineer has to establish a soundspace. All I’m saying here is that sometimes this soundspace is too artificial; in attempting to reproduce some of a band’s positioning, it creates music that doesn’t sound realistic. You certainly don’t want all the instruments in the center, but putting them far to either side can sound strange. Could it be that these recordings are mixed for people who keep their speakers very close together? I don’t; I have speakers on my desk that are a couple of feet to either side of my head, and my living room stereo’s speakers are fairly far apart. This speaker positioning makes sense for most recordings – especially those of an orchestra – but for some recent recordings, it just sounds weird. I like the idea of the Kindle, and the idea of the Kindle Paperwhite even more. Offering the ability to read both outdoors in sunlight, and indoors with a backlight, it seems like the best of both worlds. Alas, having received a Kindle Paperwhite yesterday, I’m very disappointed. Not only is the backlight not very bright – not really bright enough to read indoors if there’s a lot of light – but it’s very uneven, with dark spots around the edges, especially at the bottom. 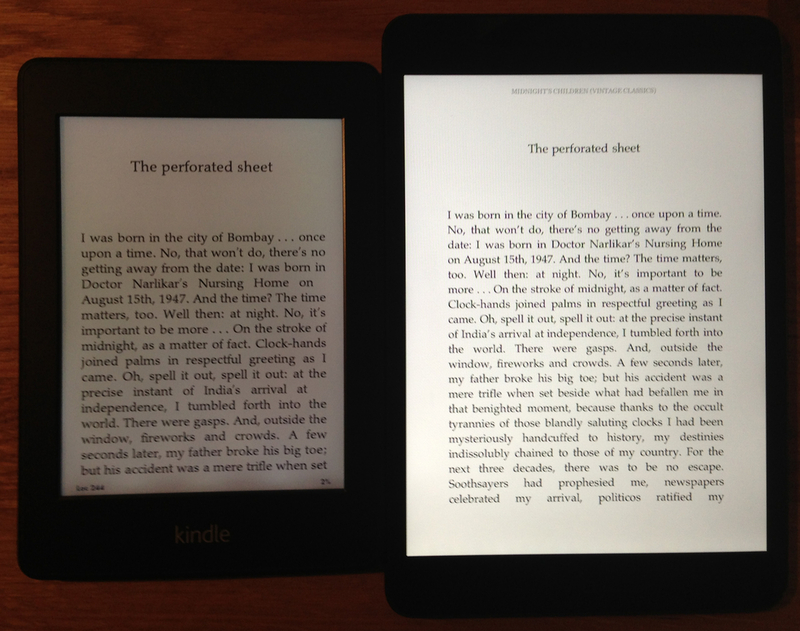 As you can see, even in this small photo, the lighting is uneven at the bottom of the Kindle, and there is a very large difference in brightness (both devices are set to maximal brightness in the photo above). While the iPad mini won’t work in bright light – such as outdoors – I have a Kindle Touch for that. So that Paperwhite is being returned. It’s a good idea, but it’s just a bit cheap and poorly designed. Amazon should really do better with a device like this.